To investigate apoptosis resistance upon restimulation in human peripheral blood T lymphocytes, we used the following in vitro model. This model represents the main features of T cell reactivity: freshly isolated PHA-activated T cells cultured in IL-2 for a prolonged period of time develop a CD95 (APO-1/Fas) apoptosis-sensitive phenotype. These T cells represent activation-induced cell death-sensitive T cells during the down phase of an immune response. A fraction of apoptosis-sensitive activated T cells becomes apoptosis resistant upon TCR/CD3 restimulation. CD95 apoptosis sensitivity requires formation of a functional receptor associated death-inducing signaling complex (DISC), i.e., a protein complex of CD95 receptors, the adaptor Fas-associated death domain protein (FADD)/MORT1 and caspase-8 (FADD-like IL-1β-converting enzyme (FLICE), MACH, Mch5). We identified activation of procaspase-8 at the DISC as the main target for the protective activity of TCR/CD3 restimulation. We found that procaspase-8 cleavage is reduced in T cells after TCR/CD3 restimulation. In addition, we detected up-regulation of c-FLIPS (the short splice variant of the cellular FLICE inhibitory protein) and strongly enhanced recruitment of c-FLIPS into the DISC. These data suggest that the recruitment of c-FLIPS into the DISC results in reduced DISC and caspase-8 activity. T lymphocytes become activated upon TCR cross-linking by Ags or reagents that mimic the Ag signal. Alternatively, TCR activation can also lead to activation-induced cell death (AICD).3 AICD is an efficient way to remove T lymphocytes via apoptosis. Apoptosis plays an important role in the maintenance of immune homeostasis. Apoptosis can be induced through several death receptors belonging to the TNFR/nerve growth factor receptor superfamily: CD95 (APO-1/Fas) (1, 2), TNFR1 (3), DR3/APO-3 (4), TNF-related apoptosis-inducing ligand receptor (TRAILR) 1/DR4/APO-2 (5), TRAILR2/DR5 (6), and DR6 (7). AICD is mediated predominantly by interaction of CD95 with its cognate ligand (CD95 ligand) (8, 9, 10, 11). TCR-stimulated T cells express the CD95 ligand which triggers CD95 by clustering of the receptors. This enables the adaptor molecule Fas-associated death domain (FADD)/MORT1 (12, 13) and the zymogen of caspase-8 (FADD-like IL-1β-converting enzyme (FLICE), MACH, Mch5) (14, 15, 16) to bind to CD95 via homophilic death domain and death effector domain (DED) interactions, respectively. Thus, a death-inducing signaling complex (DISC) is formed (17). Recruitment of procaspase-8 to the DISC leads to its proteolytic activation initiating a cascade of caspase activation that finally leads to apoptosis (18). CD95-mediated apoptosis is crucial for the regulation of lymphocyte homeostasis and defects or imbalances of the CD95 system give rise to autoimmune disorders (19, 20). Several mechanisms have been proposed to interfere with death receptor-induced apoptosis (21, 22). 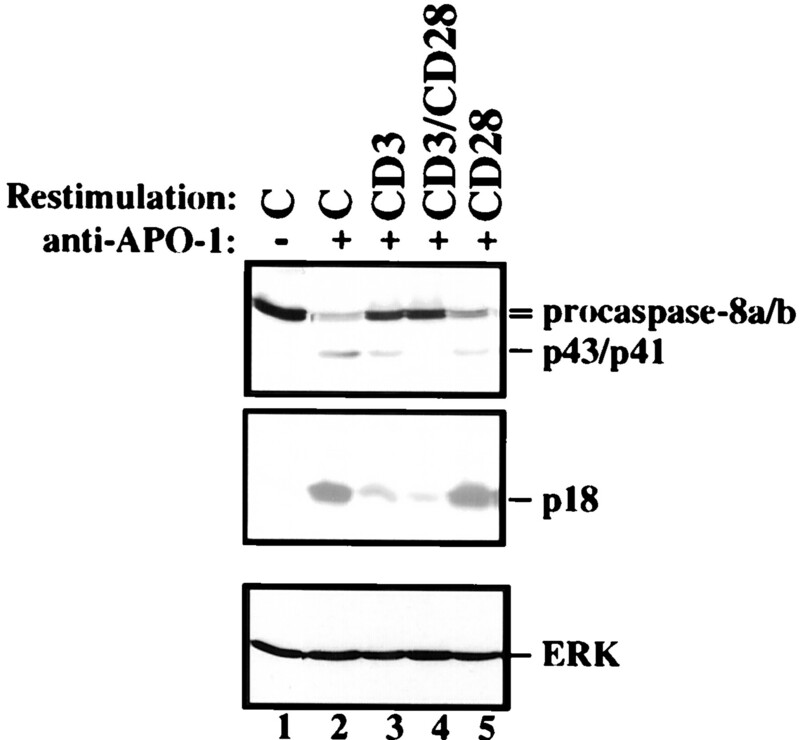 Sensitivity toward CD95-mediated apoptosis can be modulated by various antiapoptotic proteins. A new class of virus-encoded apoptosis inhibitory molecules, designated viral FLICE inhibitory proteins (v-FLIPs), have been described previously (23, 24, 25). These molecules are composed of two DEDs (23). Cellular homologues of v-FLIPs have been identified by different groups and have been termed c-FLIP (26), CASH (27), Casper (28), CLARP (29), FLAME-1 (30), I-FLICE (24), MRIT (31), and Usurpin (32). On the mRNA level, c-FLIPs exist as multiple splice variants, but on the protein level only two endogenous forms, c-FLIPlong (c-FLIPL) and c-FLIPshort (c-FLIPS) could be detected so far (26, 28, 33). c-FLIPL is structurally similar to procaspase-8; it contains two DEDs and a caspase-like domain. This domain lacks residues that are important for its catalytic activity, most notably a cysteine residue within the active site. The short form of c-FLIP structurally resembles v-FLIP containing also two DEDs. Both c-FLIP species were found to be recruited to the DISC (33); c-FLIPL expressed at high levels after stable transfections completely blocked CD95-mediated apoptosis by inhibition of procaspase-8 activation (33, 34). The susceptibility of peripheral T cells toward CD95-mediated apoptosis depends on T cell reactivity: resting T cells and activated T cells during the early immune response preserve their capacity to perform an immune response by a CD95 apoptosis-resistant phenotype. They become sensitive toward AICD during the down phase of the immune response (8, 9). Upon reactivation, a fraction of apoptosis-sensitive activated T cells develops an apoptosisresistant phenotype (35, 36, 37, 38). Resistance of these cells might be important to generate T cell memory. To investigate the molecular basis of apoptosis resistance upon restimulation in peripheral human T lymphocytes, we used an in vitro model. This model represents the main features of the stages of the T cell apoptosis phenotype during an immune response. We demonstrate here that resistance toward apoptosis is mediated by inhibition of DISC activity, the result of strongly reduced recruitment of procaspase-8 into the DISC and of inhibition of caspase-8 activation. We detected slightly increased amounts of c-FLIPL and large amounts of c-FLIPS in the DISC upon TCR/CD3 triggering. This composition of the DISC molecules prevented procaspase-8 activation (33). Taken together, we demonstrate here for the first time that c-FLIPS is up-regulated under physiological conditions. These results support the role of c-FLIPS as an inhibitor of CD95-mediated apoptosis in T cells. Human peripheral T cells were cultured and prepared as previously described (24). For stimulation, resting T cells (day 0) were cultured at 2 × 106 cells/ml with 1 μg/ml PHA for 16 h (day 1). Day 1 T cells were then washed three times and cultured for an additional 4 days in the presence of 30 U/ml IL-2 (day 5), if not otherwise stated. Alternatively, day 0 resting or day 5 preactivated T cells were activated/reactivated via TCR/CD3 at 2 × 106 cells/ml with plate-coated anti-CD3 Ab OKT3 (30 μg/ml) cross-linked with goat anti-mouse IgG (2.5 μg/ml; PharMingen, San Diego, CA). Costimulation via CD28 was achieved by the addition of an anti-CD28 Ab (1.5 μg/ml) in addition to OKT3 for the same time period. The anti-CD28 isotype-identical Ab I2DIII was added to cells treated with OKT3 only. Stimulation of CD28 alone was performed by addition of the anti-CD28 Ab. Cycloheximide (CHX; 5 μg/ml) was added to the medium as indicated. The coding sequence of c-FLIPS was isolated after total RNA isolation of H9 cells, RT-PCR and subsequent PCR, using the following primer pair: c-FLIPS sense: 5′-ggcgaattcATGcccgggTCTGCTGAAGTCATCCATCCAGG-3′ and c-FLIP antisense: 5′-cgtctagaTCACATGGAACAACAATTTCCAAG-3′. The sequence shown in capital letters is homologous to the coding sequence of c-FLIPS. The isolated PCR fragment was cloned into pcDNA3 (Invitrogen, San Diego, CA); the correct sequence was confirmed by sequencing. BJAB cells were cultured in RPMI 1640 medium (Life Technologies, Rockville, MD) supplemented with 10% heat-inactivated FCS (Life Technologies), 5 mM l-glutamine (Life Technologies), and 100 μg/ml gentamicin (Life Technologies). Stable transfection was performed with an expression vector coding c-FLIPS (pcDNA3-c-FLIPS) or the empty vector alone (control) using the electroporation method. Selection pressure was added 48 h after transfection (4000 μg/ml G418; Sigma, St. Louis, MO) for 3 wk. A total of 5 × 105 cells was incubated in 24-well plates with the corresponding Abs. Cells were centrifuged in a Minifuge (Heraeus, New York, NY) at 2000 rpm for 5 min, washed once with PBS, and resuspended in a buffer containing 0.1% (w/v) sodium citrate, 0.1% (v/v) Triton X-100, and 50 μg/ml propidium iodide (Sigma). After incubation at 4°C in the dark for at least 16 h, apoptotic nuclei were quantified by FACScan (Becton Dickinson, Mountain View, CA). Specific apoptosis was calculated as follows: (percentage of experimental apoptosis − percentage of spontaneous apoptosis)/(100 − percentage of spontaneous apoptosis) × 100. DISC analysis was performed as follows: day 5-activated primary T cells (5 × 107 cells) were stimulated either via the TCR/CD3, via CD28, or a combination of both for 24 h with the agonistic Abs. CD95 receptors were cross-linked with 2 μg/ml anti-APO-1 (IgG3) (1) for 3 min at 37°C, and the cells were lysed in lysis buffer (30 mM Tris-HCl (pH 7.5), 150 mM NaCl, 2 mM EDTA, 1% (v/v) Triton X-100, and 1 mM PMSF). Lysates were precleared for 1 h with the IgG3 Ab FII23 (39). The CD95 DISC was precipitated for 4 h at 4°C with anti-IgG3-biotin-labeled Ab (10 μg; PharMingen) coupled to 30 μl streptavidin beads (Pierce, Rockford, IL). The beads were then washed five times with 20 volumes of lysis buffer. For Western blotting, the immunoprecipitates were separated by 12% SDS-PAGE and transferred to a Hybond C nitrocellulose membrane (Amersham, Arlington Heights, IL), blocked with 5% nonfat milk powder in PBS/Tween 20 (PBS + 0.05% Tween 20) for at least 1 h, washed with PBS/Tween 20, and incubated with the HRP primary Ab in PBS/Tween 20 for 16 h at 4°C. Blots were developed with HRP-conjugated secondary Ab diluted 1/20,000 in PBS/Tween 20 containing 0.5% nonfat milk powder. After washing with PBS/Tween 20, blots were developed with the chemiluminescence method following the manufacturer’s protocol (NEN, Boston, MA). For the in vitro cleavage assays, [35S]methionine-labeled procaspase-8/a or c-FLIPL was in vitro translated using a T7 polymerase-directed reticulate lysate system (TNT; Promega, Madison, WI). The beads, (containing the DISC) were incubated in 50 μl reaction buffer (50 mM HEPES (pH 7.4), 100 mM NaCl, 0.1% 3-(cyclohexylamino)-1-propanesulfonic acid, 10 mM DTT, and 20% sucrose) for 24 h at 4°C. Resulting products were analyzed by 15% SDS-PAGE with subsequent amplification (Amplify; Amersham), drying of the gels, and autoradiography. For Western blot analysis, postnuclear supernatant equivalents of 30 μg protein (if not otherwise indicated) as determined by the bicinchoninic acid method (Pierce) were separated by 12% SDS-PAGE, blotted onto a Hybond C nitrocellulose membrane, and blocked with 5% nonfat milk powder in PBS/Tween 20 (0.05% Tween 20 in PBS). After washing with PBS/Tween 20, blots were incubated with HRP-coupled isotype-specific secondary Abs (1/10,000) for 1 h at room temperature, washed again, and developed as described above. The mAb against FADD and anti-extracellular signal-regulated kinase-1 mAb were purchased from Transduction Laboratories (Lexington, KY). C15 mAb (mouse IgG2b) recognizing the p18 subunit of caspase-8 have been described in Ref. 40 , the anti-c-FLIP mAb NF6 (mouse IgG1) was described in Ref. 33 . The HRPO-conjugated goat anti-mouse IgGs were from Santa Cruz Biotechnology (Santa Cruz, CA). The anti-APO-1 was described in Ref. 1 . The hybridoma for anti-CD28, OKT3, and the CD28 isotype-specific Ab I2DIII was obtained from G. Moldenhauer, (German Cancer Research Center, Heidelberg, Germany). To measure Δψm of day 6 primary T cells with or without prestimulation by OKT3 and subsequent anti-APO-1 (1 μg/ml) treatment for 4 h, T cells (5 × 105/ml) were incubated with 3,3-dihexyloxacarbocyanine iodide (460 ng/ml, FL-1; Molecular Probes, Eugene, OR) for 15 min at 37°C in the dark followed by analysis on a flow cytometer (FACScan; Becton Dickinson). T cells change their sensitivity toward apoptosis during an immune response. This is represented by an in vitro model we used in our experiments. As illustrated in Fig. 1⇓A, freshly isolated peripheral blood T cells (day 0) were resistant toward CD95-mediated apoptosis. Stimulation with PHA for 16 h (day 1) resulted in up-regulation of CD95 (Ref. 41 and data not shown). These T cells remained resistant to CD95-mediated apoptosis. Continuous culture in the presence of IL-2 (30 U/ml), however, rendered them sensitive to CD95-mediated apoptosis (Fig. 1⇓A; Refs. 33, 35, 41). Restimulation induces apoptosis resistance to CD95-mediated apoptosis in 6-day activated apoptosis-sensitive T cells. 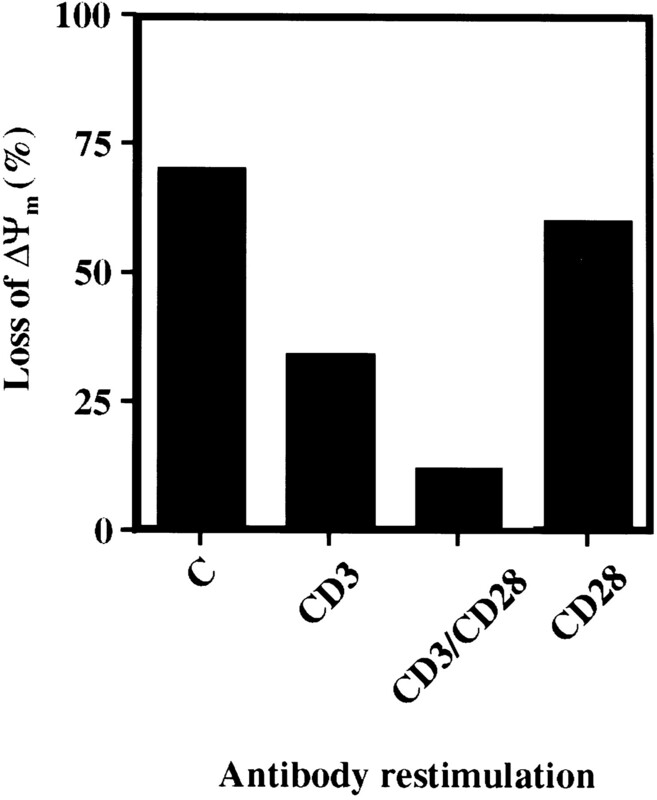 A, Development of sensitivity of activated T cells to CD95-mediated apoptosis. The sensitivity of resting T cells (d0), T cells treated with PHA (d1), and T cells subsequently cultured with 30 U/ml IL-2 (d2–d5) to CD95-mediated apoptosis was determined as described in Materials and Methods. B and C, 5-day activated T cells primarily stimulated with PHA were restimulated either via TCR/CD3, CD28, or a combination of both for 24 h as described in Materials and Methods. After this time period, T cells were triggered via CD95 for an additional 12 h (B) or the cells were treated with the control Ab FII23 (C). 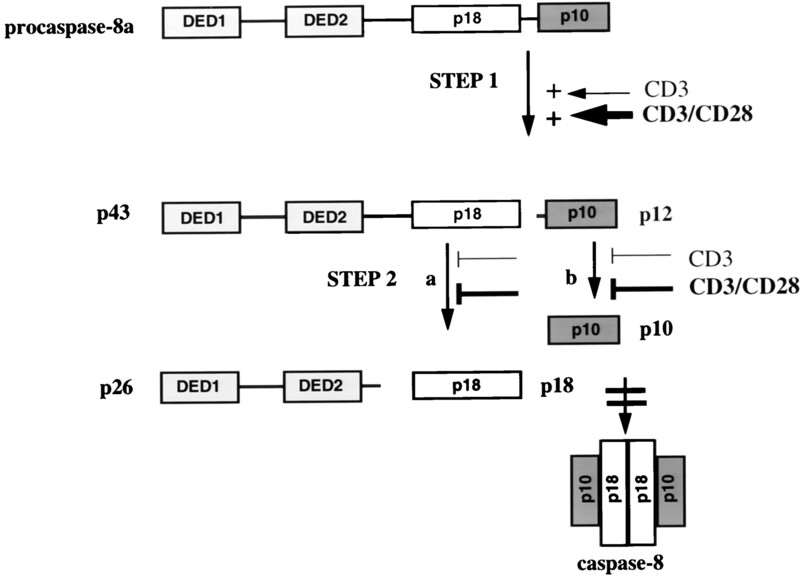 D and E, 5-day activated T cells primarily stimulated via TCR/CD3 were treated as described in B and C. In D, the apoptosis rate is shown upon CD95 triggering. E demonstrates the result of the isotype-matched Ab control FII23. The results are representative of five independent experiments performed in triplicates with T cells from different blood donors. Under physiological conditions, TCR/CD3 stimulation induces activation and proliferation of resting T cells. Restimulation of activated T cells through the TCR/CD3 results in AICD in a fraction of the restimulated T cells. To determine whether resistance toward AICD of the surviving T cell population can be explained by modulation of the CD95 pathway, we restimulated day 5 apoptosis-sensitive T cells via TCR/CD3 and triggered CD95 subsequently. Our data show that restimulation of activated T cells (day 5) via TCR/CD3 for 24, 48, or 72 h completely inhibited CD95-mediated apoptosis (Fig. 1⇑B and data not shown). Only residual apoptosis induced by TCR/CD3 triggering alone was detectable (Fig. 1⇑C). Costimulation via CD28 reduced TCR/CD3-mediated apoptosis and further enhanced this antiapoptotic effect. In the experiments described so far, day 0 T cells were stimulated by PHA. This mode of activation results in cross-linking of several cell surface molecules, including the TCR. Stimulation of freshly isolated T cells via the TCR/CD3 represents a more physiological stimulus. Therefore, we investigated whether restimulation by TCR/CD3 of T cells primarily stimulated via TCR/CD3 instead of PHA also inhibits CD95-mediated apoptosis. As demonstrated in Fig. 1⇑D, stimulation of primary T cells via TCR/CD3 instead of PHA also resulted in resistance toward CD95-mediated apoptosis. However, the percentage of apoptotic T cells induced either via CD95 or TCR/CD3 (compare Fig. 1⇑E) was always lower than that of apoptosis of PHA-stimulated T cells. PHA activation, however, leads to cross-linking of several cell surface proteins, which might be the reason for stronger activation of T cells. To exclude the possibility that CD95 cell surface expression might be reduced upon TCR/CD3 stimulation and might lead to resistance toward CD95-mediated apoptosis, we first measured cell surface expression of CD95 in the absence or presence of TCR/CD3 restimulation. No significant differences in cell surface staining were found (data not shown). Cellular levels of FADD and caspase-8 were also not significantly modulated after restimulation (data not shown and Fig. 3⇓). Upon CD3 restimulation, a certain amount of caspase-8 is activated, reflecting T cells undergoing apoptosis. This has to be taken into account when comparing cellular protein levels of caspase-8. Taken together, TCR/CD3 restimulation of activated apoptosis-sensitive T cells induces a signaling pathway that blocks CD95-mediated apoptosis in a fraction of these cells and costimulation via CD28 enhances this antiapoptotic effect. To clarify whether TCR/CD3 restimulation mediates resistance toward CD95-mediated apoptosis upstream or downstream of the mitochondria, we determined the mitochondrial transmembrane potential of day 5-activated T cells upon CD95 triggering with or without restimulation of the TCR/CD3. As demonstrated in Fig. 2⇓, TCR/CD3 triggering totally blocked CD95-mediated loss of the Δψm after 4 h of CD95 cross-linking and 24 h of TCR/CD3 triggering. The remaining loss of Δψm was also detected when the cells were restimulated either via TCR/CD3 or in combination with CD28 (data not shown). We conclude from these experiments that the antiapoptotic effect of TCR/CD3 triggering is located between the CD95 receptor and the mitochondria. Restimulation induces resistance to CD95-mediated apoptosis upstream of the mitochondria. The loss of the mitochondrial membrane potential Δψm was determined by the uptake of 3,3-dihexyloxacarbocyanine iodide in day 6-activated T cells primarily stimulated with PHA restimulated with the indicated Abs for 24 h and triggered via CD95 for an additional 4 h. The results are representative of three independent experiments performed in triplicates with T cells from different blood donors. Since caspase-8 is the first caspase activated and the initiator caspase upon CD95 triggering, we investigated whether procaspase-8 activation is reduced upon TCR/CD3 stimulation. Day 5 T cells were restimulated via TCR/CD3 for 24 h and CD95 was triggered for an additional 4 h subsequently. Procaspase-8 activation was determined by Western blot analysis. Generation of active subunits of caspase-8 was significantly reduced in T cells restimulated via TCR/CD3 before CD95 triggering (Fig. 3⇓, compare lanes 2 and 5 with 3 and 4). This effect was enhanced by costimulation via CD28, which explains the stronger inhibition of CD95-mediated cell death in case of costimulation. Thus, we demonstrate that TCR/CD3 restimulation prevents activation of procaspase-8. This inhibition is further enhanced by triggering of CD28. T cell restimulation prevents the generation of active caspase-8 subunits. Day 6-activated T cells restimulated with the indicated Abs for 24 h were triggered via CD95 (lanes 2–5, anti-APO-1) for 4 h or left untreated (C, lane 1). Twenty or 30 μg (for detection of the p18 subunit) protein was subjected to 12% SDS-PAGE and analyzed by Western blotting using the C15 (anti-caspase-8) Ab or a monoclonal anti-extracellular signal-regulated kinase 1 Ab for normalization of equal loading in case of the blot for the detection of the p18 subunit. C, without Ab treatment. The Western blot is representative of five independent experiments performed with T cell lysates from different blood donors. As shown previously, the presence of c-FLIPL in the DISC prevents recruitment of full-length procaspase-8 and, therefore, procaspase-8 activation upon CD95 cross-linking (18, 33). To test whether increased levels of c-FLIPs are recruited to the DISC after TCR/CD3 stimulation, we performed a DISC analysis of TCR/CD3-restimulated T cells in the presence or absence of CD28 triggering (Fig. 4⇓). The level of c-FLIPL and the cleavage product of c-FLIPL (p43) in the DISC were only slightly increased. In contrast, the amount of c-FLIPS was significantly increased in the DISC in T cells restimulated via TCR/CD3 (Fig. 4⇓, lanes 2 and 3). In addition, full-length procaspase-8 was hardly detectable in the DISC of cells which recruited high amounts of c-FLIPS into the DISC. This could be due to the fact that the presence of c-FLIPS prevents recruitment of procaspase-8, or, alternatively, there might be an enhancement of the initial step of procaspase-8 cleavage in CD3-treated cells. However, we detected procaspase-8 in the cytosol of CD3-treated cells (Fig. 3⇑), which supports the former explanation. Since c-FLIPL was also described to act as an antiapoptotic protein, the slight increase of c-FLIPL might also contribute to the protective effect. However, the high amounts of c-FLIPS are more likely to be involved in the inhibition of procaspase-8 activation and apoptosis. c-FLIPS expression correlates with resistance toward CD95-mediated apoptosis. A, T cell restimulation leads to the recruitment of high amounts of c-FLIPS in the DISC. Western blot analysis of the CD95 DISC of day 6 T cells restimulated for 24 h with the indicated Abs. A total of 4 × 107 T cells was triggered via CD95 with anti-APO-1 for 2 min at 37°C and subsequently lysed. The CD95 DISC was immunoprecipitated as described in Materials and Methods. Immunoprecipitates were analyzed by Western blotting using anti-c-FLIP, anti-caspase-8, and anti-FADD mAbs. Migration positions of the detected proteins are indicated. The results are representative of five independent experiments performed with T cells from different blood donors. B, Stably transfected BJAB cells, expressing different amounts of c-FLIPS, were resistant toward CD95-mediated apoptosis induced with anti-APO-1 in a dose-dependent manner. The results are representative of three independent experiments performed in triplicates. C, Expression levels for c-FLIPS in the clones used in B were detected by Western blot analysis. c-FLIPShi, high expression of c-FLIPS. To test whether high amounts of c-FLIPS alone also inhibit DISC formation and apoptosis, we generated BJAB cells stably transfected with an expression construct coding for c-FLIPS. 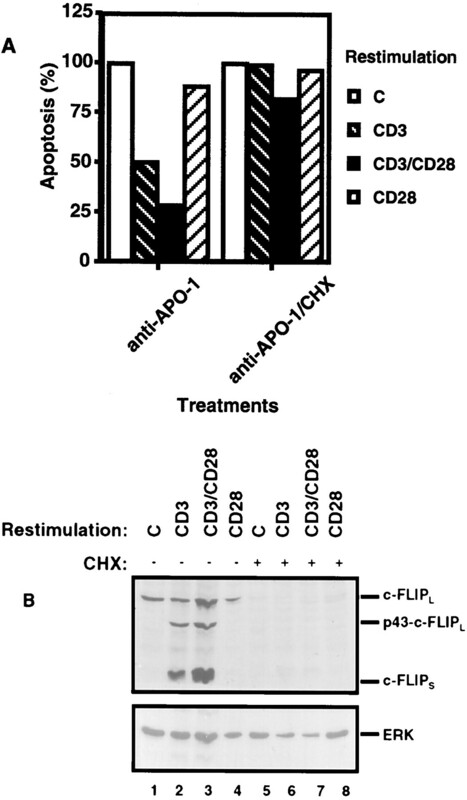 CD95-mediated apoptosis was significantly reduced in clones expressing additional c-FLIPS in a concentration-dependent manner (Fig. 4⇑B). These experiments demonstrate that high amounts of c-FLIPS protect cells from CD95-mediated apoptosis. Since c-FLIPS is strongly up-regulated upon TCR/CD3 stimulation, it also contributes to the resistance of T cells toward CD95-mediated apoptosis upon restimulation via TCR/CD3. To prove that the DISC activity is reduced upon TCR/CD3 restimulation and procaspase-8 activation in the DISC is reduced, we performed an in vitro caspase-8 and c-FLIPL cleavage assay. As demonstrated in Fig. 5⇓, TCR/CD3 stimulation reduced DISC activity measured in vitro by cleavage of [35S]methionine-labeled procaspase-8/a and c-FLIPL. DISC activity was further reduced upon costimulation via CD28. We observed that CD28 stimulation also results in slightly enhanced generation of the p12 subunit. However, this effect proved to be strongly dependent on the blood donor, possibly reflecting different stages of T cell activation before preparation of the cells. If freshly prepared cells were already preactivated, CD28 stimulation might lead to similar effects as observed after CD3 restimulation. The effects of CD28 stimulation on DISC activity remain to be further clarified. The generation of both the p18 and p10 active subunits of caspase-8 (Fig. 5⇓A, lanes 2 and 3) and the p10 subunit of c-FLIPL was strongly inhibited upon TCR/CD3 restimulation in the absence or presence of CD28 costimulation (Fig. 5⇓B, lanes 2 and 3). From this experiment, we conclude that TCR/CD3 restimulation prevents DISC activity. T cell restimulation leads to reduced DISC activity. The CD95 DISC of day 6-activated T cells, restimulated with the indicated Abs, was immunoprecipitated upon CD95 triggering for 3 min, washed four times, and an in vitro cleavage assay was performed either with in vitro-translated 35S-labeled procaspase-8/a (A) or with c-FLIPL (B). The input control (lane 5) was incubated in the same manner but without addition of the DISC. After an incubation time of 24 h, supernatants were subjected to 15% SDS-PAGE. The positions of procaspase-8/a and its cleavage products p43, p26, p18, p12, and p10 are indicated in A; c-FLIPL and its cleavage products p43 and p10 are indicated in B. The results are representative of three independent experiments performed from different blood donors. To further support the idea that c-FLIPS is involved in TCR/CD3-mediated resistance toward CD95-induced apoptosis, we restimulated day 5 T cells via TCR/CD3 for 24 h in the presence of CHX for the last 16 h. Following this induction period, both c-FLIPs totally disappeared from the lysates of the cells (Fig. 6⇓B). In parallel, we tested CHX-treated T cells for their sensitivity to CD95-mediated apoptosis. CHX treatment completely restored sensitivity toward CD95-mediated apoptosis after TCR/CD3 restimulation in the absence or presence of CD28 costimulation (Fig. 6⇓A). Thus, we observed a correlation among the presence of c-FLIPS, inhibition of procaspase-8 activation, and resistance toward CD95-mediated apoptosis. Increase in sensitivity toward CD95-mediated apoptosis by preincubation with CHX of day 6-activated T cells restimulated via TCR/CD3. A, Apoptosis of day 6-activated T cells restimulated with the indicated Abs for 24 h and triggered via CD95 (anti-APO-1) for the last 12 h in the absence (left part) or presence of CHX (right part) (5 μg/ml for the last 18 h) was determined. B, In parallel, Western blots were performed of lysates of day 6-activated T cells restimulated as indicated in A with or without CHX. The experiments are representative of three independent experiments performed from different blood donors. 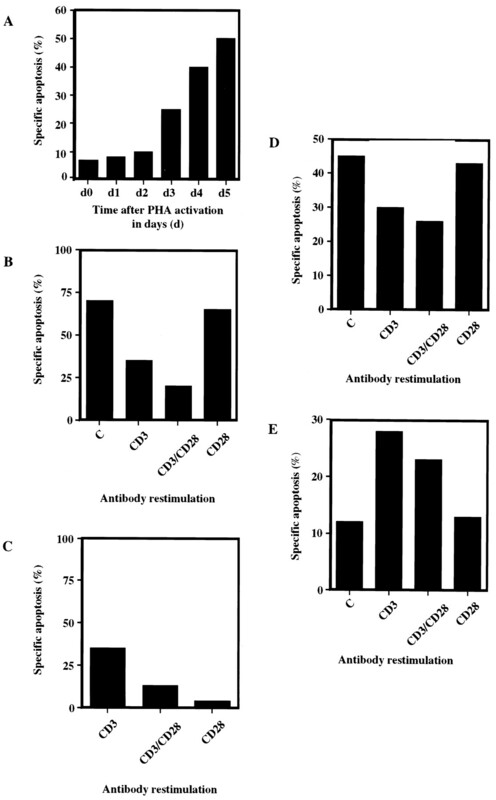 In this study, we demonstrate that TCR/CD3-restimulated apoptosis-sensitive activated T cells become resistant toward CD95-mediated apoptosis in contrast to T cells which were freshly activated once either by PHA or TCR/CD3 and not restimulated, but merely cultured for a prolonged period (Fig. 1⇑). Resistance is the result of reduced procaspase-8 activation due to reduced DISC activity. Furthermore, we demonstrated that these effects are enhanced upon costimulation via CD28. TCR/CD3-restimulated T cells contain slightly enhanced amounts of c-FLIPL and significantly higher levels of c-FLIPS in the DISC, which is likely to be responsible for the resistant phenotype (Fig. 4⇑A). Several mechanisms have been reported which control sensitivity of T cells toward CD95-mediated apoptosis. One of these proposed mechanisms involves the anti-apoptotic molecule c-FLIP (26, 33, 42). Algeciras-Schimnich et al. (43) demonstrated that sensitization of resting peripheral T cells to CD95-mediated apoptosis following TCR stimulation is due to a decrease of c-FLIPL in their experimental system. Activated T cells arrested in G1 phase contain high levels of c-FLIPL. In contrast, T cells arrested in S phase show decreased c-FLIPL protein levels. However, in our model system of restimulation, which differs from the model used by Algeciras-Schimnich et al. (43) with respect to the activation state of the T cells studied, we did not detect any significant differences in the cell cycle between activated and restimulated T cells. In our system, activated (i.e., proliferating) and restimulated T cells are investigated. Therefore, a possible involvement of cell cycle regulation seems to be unlikely or at least of minor importance. Clearly, our results do not conflict with an involvement of the cell cycle in the transition from resting to activated T cells as studied by Algeciras-Schimnich et al. (43). The cell surface protein Toso was also recently identified to be induced upon TCR/CD3 stimulation and was claimed to inhibit CD95-mediated apoptosis (44). Whether Toso mediates its antiapoptotic function by increasing the protein concentration of c-FLIP remains to be clarified. Furthermore, Bcl-2 family members are also described to exert an antiapoptotic function in CD95-mediated apoptosis (45). Indeed, we detected elevated levels of Bcl-xL (data not shown) which might also contribute to apoptosis resistance. However, since procaspase-8 is directly activated at the DISC and its activation was decreased in our experiments, Bcl-xL up-regulation might be less important and only contribute further to the antiapoptotic phenotype. Hildeman et al. (46) reported that activated T cells died independently of CD95 or TNF-α. In their studies, it was possible to block AICD by manganese(III) tetrakis (5,10,15,20-benzoic acid) porphyrin. In addition, Varadhachary et al. (47) recently demonstrated that Th1 cells are susceptible to CD95-mediated apoptosis in contrast to Th2 cells which are resistant upon TCR/CD3 restimulation. These authors prestimulated T cells with anti-CD3 for 30 min, which resulted in inhibition of procaspase-8 cleavage. They identified phosphatidylinositol 3 kinase (PI3 kinase) as the key signaling molecule that regulates the resistance of Th2 cells. We also detected protection toward CD95-mediated apoptosis after TCR/CD3 triggering for 30 min. However, in their experimental approach, these authors did not detect any change in c-FLIP expression levels. Therefore, PI3 kinase up-regulation might be an early and fast event that prevents T cell apoptosis immediately after TCR/CD3 stimulation. Later after T cell activation, survival might be regulated by the mechanism presented here. This mechanism seems to be independent of PI3 kinase activity, because in our system, the presence of the PI3 kinase inhibitor wortmannin did not sensitize restimulated T cells toward apoptosis (data not shown). In our model, procaspase-8 activation is prevented by high amounts of c-FLIPS in the DISC upon TCR/CD3 stimulation. Taken together, we have shown that T cells stimulated with PHA or TCR/CD3 and then cultured in IL-2 for a prolonged period of time are sensitive toward CD95-mediated apoptosis. Upon restimulation via TCR/CD3, a fraction of these sensitive T cells changes its phenotype toward resistance. Restimulation of TCR/CD3 leads to a minor increase of c-FLIPL and a major increase of c-FLIPS. These events strongly contribute to the inhibition of generation of active caspase-8 in the DISC. CD95 sensitivity is restored upon treatment of CD3-restimulated T cells with CHX, correlating with a total disappearance of c-FLIPS. However, we do not exclude the possibility that molecules other than c-FLIPS also contribute to the resistance of restimulated T cells. Similar correlations were reported by Griffith et al. (48) for the sensitization of melanoma cells toward TRAIL-induced apoptosis. In an in vitro cleavage assay, we observed that procaspase-8 cleavage is inhibited at two steps that generate the active subunits. First, the generation of the p18 subunit from the p43 cleavage product is inhibited (compare Fig. 7⇓, step 2a). In addition, the cleavage of the p10 active subunit from the p12 precursor is reduced (compare Fig. 7⇓, step 2b). Therefore, active caspase-8 cannot be generated. However, so far, we could not detect the p12 subunit in primary T cells. Difficulties in detecting the p12 subunit of caspase-8 in vivo were described previously also for cell lines (18). Proposed mechanism of the inhibition of procaspase-8 activation in TCR/CD3-restimulated T cells. TCR/CD3 restimulation inhibits DISC activity, which results in reduced generation of the active subunits p10 and p18 (step 2) of caspase-8; in parallel, the generation of the p12 subunit of caspase-8 is enhanced (step 1). In the context of an immune response, this mechanism might enable T cells to prolong their effector functions. One might even speculate that prolonged activation and resistance might result in an apoptosis-resistant phenotype of memory cells. It remains to be resolved why two different types of cellular c-FLIP proteins assemble in the DISC. Both c-FLIP molecules inhibit procaspase-8 activation and apoptosis upon overexpression (23, 33, 49). Thus, it remains unanswered whether the ratio of both c-FLIP proteins determine sensitivity toward apoptosis under physiological conditions. In contrast to c-FLIPS, c-FLIPL has structural homology with procaspase-8 and is cleaved upon CD95 triggering. This leads to the generation of the p10 subunit and the p43 cleavage product of c-FLIPL. As demonstrated in Fig. 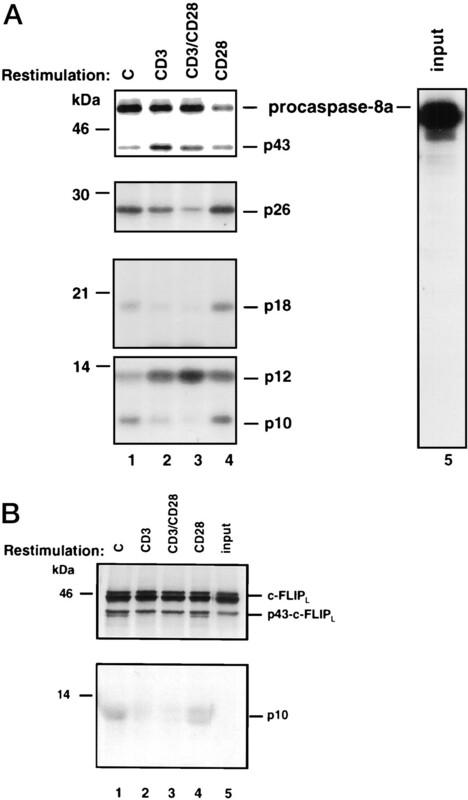 5⇑B, TCR/CD3 restimulation also prevents the cleavage of c-FLIPL in the DISC. One could assume that either the p43 cleavage product or the p10 subunit of c-FLIPL may have a special role in enhancing apoptosis. The most prominent effect demonstrated in our studies is the up-regulation of c-FLIPS correlating with apoptosis resistance of restimulated T cells. c-FLIPL and c-FLIPS might therefore be important regulators of apoptosis sensitivity and resistance, determining the capacity of T cell reactivity. We are grateful to C. Stumpf and K. Hettler for expert technical assistance. The anti-CD3, anti-CD28, and the isotype control-producing hybridoma were kindly provided by Dr. G. Moldenhauer (German Cancer Research Center, Heidelberg). We thank Drs. Weigand and Sebens for taking blood samples. We also thank all our blood donors. We thank Heidi Sauter, Thorsten Sebens, Elena Ritsou, and Sven Baumann for critical reading of this manuscript. ↵1 This work was supported by SFB405 and the Sander Stiftung. ↵3 Abbreviations used in this paper: AICD, activation-induced cell death; TRAIL, TNF-related apoptosis-inducing ligand; CHX, cycloheximide; DISC, death-inducing signaling complex; FADD, FAS-associated death domain protein; FLICE, FADD-like IL-1β-converting enzyme; FLIP, FLICE inhibitory protein; DED, death effector domain; v, viral; c, cellular; Δψm, mitochondrial transmembrane potential; PI3 kinase, phosphatidylinositol 3 kinase.